BA Delhi U., MIB IIFT, PhD Saint Louis U.
Vikas Kumar is Head of Discipline and Professor in the Discipline of International Business at the University of Sydney Business School. His previous appointments were at Bocconi University as Assistant Professor in the Department of Management, and as Visiting Scholar at Stanford University and Dunning Fellow at University of Reading. He is serving as a senior editor at the Asia Pacific Journal of Management, and was reviewing editor for the journal in 2016. Vikas was representative-at-large for the Global Strategy Interest Group in the Strategic Management Society (SMS) and was co-chair for the Sydney SMS Special Conference in December, 2014. He was the program chair of the Australia New Zealand International Business Academy (ANZIBA) 2016 conference and is co-program chair for the Asia Academy of Management (AAOM) Conference in 2017. He is founding director of the Emerging Market Internationalization Research Group at the University of Sydney Business School. Vikas is a member of the Academy of International Business, Academy of Management, and Asia Academy of Management. He is on the Editorial Review Board of Journal of Management Studies, Journal of World Business, Management International Review and Global Strategy Journal. Vikas is interested in studying the internationalization strategies employed by firms from emerging markets such as India. His research involves understanding the unique aspects of the institutional and cultural context of emerging markets and the influence context has on firm strategies. His research has been published in Journal of World Business, Global Strategy Journal, Management International Review, Journal of Management Studies, Journal of International Management and Long Range Planning among other journals in the field of international business and management. Vikas has co-edited a book on ‘Global outsourcing and offshoring’ published by Cambridge University Press and on ‘Emerging Market Firms’ published by Emerald. 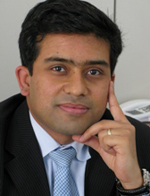 Vikas received the inaugural Excellence in Research Award by the University of Sydney Business School in 2013. His co-authored research article on ‘Indian business groups’ in Corporate Governace: An International Review received the 2nd best paper award in 2009. In 2007, Vikas received the best reviewer award by the International Management Division at the Academy of Management. In a recent study by Yadong Luo and Huan Zhang published in the Journal of International Management, Vikas was ranked among the top 15 authors based on impact in the field of ‘emerging market firm internationalization’. Vikas’ research explores the (i) the increasing competitiveness of emerging market firms, (ii) unique attributes of emerging market firm internationalization, and (iii) strategy of business groups. His recent work focuses on the interplay of institutions and firm strategy, social networks and internationalization as well as implications of speed of internationalization. These research topics build on his previous lines of enquiry which dealt with (iv) performance implications of internationalization, (v) the impact of business group affiliation on firm performance and internationalization behaviour, and (vi) the role of outsourcing and offshoring in the internationalization process of firms. Vikas has pursued a majority of this research in the Indian context, as India presents a unique laboratory to test and build on existing international business, management and strategy theories. Kumar V, Pedersen T, and Kundu S (2012) Does Business Group Affiliation Aid or Deter Firm Internationalization? Australia and New Zealand International Business Academy Conference ANZIBA 2012 - Fusion or Fracturing Implications for International Business; Anziba, Adelaide, Australia. Contractor F, Kumar V, Kundu S, and Petersen T (2011) Global Outsourcing and Offshoring: An Integrated Approach to Theory and Corporate Strategy; Cambridge University Press, United Kingdom. Kumar V (2011) Introduction: What is International Business? – Closing Case: Welspun Group: Riding the Globalization Wave International Business (Australasian edition); Pearson Education Australia, Sydney, Australia. Kumar V, Annushkina O, and Dubini P (2010) What drives firms to internationalize from emerging to developed economies? A qualitative study of European and Asian firms Australia and New Zealand International Business Academy Conference ANZIBA 2010; Faculty of Economics and Business, University of Sydney, Australia. Gaur A, and Kumar V (2010) Internationalization of Emerging Market Firms: A Case for Theoretical Extension The Past, Present and Future of International Business & Management (Advances in International Management - Volume 23); Emerald Group Publishing, United Kingdom, 603-627. Gaur A, Kumar V, and Singh D (2009) Strategic Shift from Exports to FDI in the Internationalization of Emerging Economy Firms 35th European International Business Academy (EIBA) Annual Conference, 2009. Gaur A, Singh D, and Kumar V (2009) Resources, Institutions and Internationalization Process of Emerging Market Firms Academy of Management 2009 Annual Meeting: Green Management Matters; Academy of Management, United States of America. Gaur A, Singh D, and Kumar V (2009) Internationalization Process of Emerging Market Firms: Analyzing the Shift from Exports to FDI Academy of International Business (AIB) 2009 Annual Meeting; Academy of International Business, United States of America. Kumar V (2008) Debate: Does Nationality Still Matter? European Business Forum, 32, 23-24. Kumar V (2008) "National champion" status can be a mixed blessing. Just ask some of India's most prominent companies. (Debate Does nationality still matter?) European Business Forum, 32 (March (Spring)). Jain N, Kumar V, and Kundu S (2008) Internationalization of Emerging Market Firms: Search for New Direction 2008 Academy of Management Annual Meeting; Academy of Management, United States. Jain N, Kumar V, Kundu S, and Zahra S (2008) The Limits of Our Knowledge: Competing in Emerging Markets Strategic Management Society SMS 28th Annual International Conference, 2008: How Does Knowledge Matter?. Kumar V, Pedersen T, and Jain N (2008) Impact of Ownership Type on the Internationalization of Emerging Market Firms 50th Annual Meeting of the Academy of International Business AIB 2008; Academy of International Business, United States. Kumar V, Pedersen T, Kundu S, and Jain N (2008) Business Group Affiliation and Internationalization of Emerging Market Firms 2008 Academy of Management Annual Meeting; Academy of Management, United States. Chao M, and Kumar V (2007) The Impacts of Institutional Distance and Home Country Economic Openness on the Relationship between International Diversity and Firm Performance 33rd European International Business Academy (EIBA) Annual Conference, 2007. Kumar V, and Singh N (2007) Internationalization and Performance of Indian Pharmaceutical Firms 34th AIB-UKI (Academy of International Business UK & Ireland Chapter) Conference, 2007, United Kingdom. Kumar V, Jain N, and Kundu S (2007) Ownership Type and Internationalization of Emerging Market Firms 2007 Euro-Asia Management Studies Association (EAMSA) Annual Conference. Dubini P, Annushkina O, and Kumar V (2007) L'attrazione di investimenti stranieri in Italia: gli investimenti provenienti dall'estremo oriente L'attrattività del sistema paese. Attrazione di investimenti e la creazione di relazioni; Il Sole 24 Ore Libri Pirola, Italy. Kumar V, and Gaur A (2007) Internationalization of Indian Firms: Regionalization Patterns and Impact on Performance Research in Global Strategic Management: Regional Aspects of Multinationality and Performance; Emerald Group Publishing, United Kingdom, 201-219. Gaur A, and Kumar V (2006) International Diversification, Firm Performance and Business Group Affiliation: Empirical Evidence from India Academy of Management 2006 Annual Meeting: Knowledge, Action and the Public Concern; Academy of Management, United States. Gaur A, Kumar V, and Singh D (2006) Resource Based View and Export Performance of Emerging Market Firms 48th Annual Meeting of the Academy of International Business AIB 2006; Academy of International Business, United States. Kumar V, and Chao M (2006) The Multinationality-Performance Relationship: An Institutional Theory Perspective Fourth Annual Academy of International Business (AIB)/Journal of International Business Studies (JIBS) Conference on Emerging Research Frontiers in International Business, 2006. Kumar V, Mazzola P, and Venzin M (2006) Internationalization of Retail Banks: A Micro-level Study of the Multinationality-Performance Relationship Strategic Management Society 26th Annual International Conference, 2006 : Strategy and Governance in a World of Institutional Change. Amine L, and Kumar V (2006) Coke and Pepsi Learn to Compete in India International Marketing; McGraw Hill, United States of America, 610-615. Gaur A, and Kumar V (2005) Role of Business Group Affiliation on International Diversification-Firm Performance Relationship Strategic Management Society 25th Anniversary Annual International Conference, 2005. Kundu S, Kumar V, and Peters S (2005) The Impact of Ownership and Location Factors on the Internationalization of Service Transnationals into Transition Economies: An Empirical Study 47th Annual Meeting of the Academy of International Business AIB 2005; Academy of International Business, United States. Kumar V, and Kundu S (2004) Ranking the International Business Schools: Faculty Publication as the Measure Management International Review, 44 (2), 213-228. Kumar V (2004) Social Network and Knowledge Transfer 30th European International Business Academy (EIBA) Annual Conference, 2004. Kumar V, and Kundu S (2004) The Impact of Country-level Institutional Context on the Relationship between Multinationality and Firm Performance Strategic Management Society 24th Annual International Conference, 2004, United States of America. Kumar V, and Kwon I (2004) Inter-linkages between Marketing and Supply Chain Management: A Citation Based Analysis 46th Annual Meeting of the Academy of International Business AIB 2004; Academy of International Business, United States. Amine L, and Kumar V (2003) Preliminary Results of a Longitudinal Study of Materialism and Religion Among Consumers in India Academy of International Business, South-West (USA) Annual Meeting 2003; Academy of International Business, United States of America. Kumar V, and Boggs D (2003) Supply Chains, Supply Chain Management and International Competitiveness Academy of International Business, Mid-West (USA) Annual Meeting 2003; Academy of International Business, United States of America. Kumar V, and Boggs D (2003) International Business Research: An Analysis of Author Affiliation for Journal Publications Academy of International Business, South-West (USA) Annual Meeting 2003; Academy of International Business, United States of America. Kumar V, and Kundu S (2003) Testing the Three Stages Model of Multinationality-Performance in the Indian Pharmaceutical Industry Context Academy of International Business (AIB) 2003 (45th) Annual Meeting: The Power of Ideas and International Business; Academy of International Business, United States of America. Kumar V, and Kundu S (2003) Impact of R&D and Advertising Intensity on the Multinationality-Firm Performance Relationship: The Case of India Academy of International Business, South-East (USA) Annual Meeting 2003; Academy of International Business, United States of America. Kumar V, and Kundu S (2003) Multinationality and Performance: Empirical test of the Three-Stage Theory in an Emerging Market Academy of Management Annual Meeting 2003: Democracy in a Knowledge Economy; Academy of Management, United States of America. Developing Linkages with India for the Emerging Market Internationalisation Research Group; IPDF Grant. Vikas Kumar was quoted in, In The Black, about the impact of growing populations in East Asia’s cities. Dr Vikas Kumar was interviewed on how with the rise of technology and digital call centres thousands of Indian typists who use typewriters are facing extinction.